A single-cylinder engine is a basic piston engine configuration of an internal combustion engine. It is often seen on motorcycles, auto rickshaws, motor scooters, mopeds, dirt bikes, go-karts, radio-controlled models, and has many uses in portable tools and garden machinery. Some single-cylinder automobiles and tractors have been produced, but are rare today due to developments in engine technology. 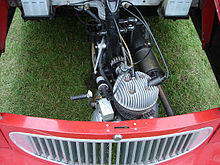 Single-cylinder engines are simple and compact, and will often deliver the maximum power possible within a given envelope. Cooling is simpler than with multiple cylinders, potentially saving further weight, especially if air cooling is used. Single-cylinder engines require more flywheel than multi-cylinder engines, and the rotating mass is relatively large, restricting acceleration and sharp changes of speed. In the basic arrangement they are prone to vibration - though in some cases it may be possible to control this with balance shafts. Early motorcycles, automobiles and other applications such as marine engines all tended to be single-cylinder. The configuration remains in widespread use in motorcycles, motor scooters, mopeds, dirt bikes, go-karts, auto rickshaws, radio-controlled models and is almost exclusively used in portable tools, along with garden machinery such as lawn mowers. Lanz Bulldog tractors and several copies by the Polish company URSUS featured large horizontally mounted single cylinder engines. The bestselling motor vehicle of the world, the Honda Super Cub, has a very fuel-efficient 49 cc single-cylinder engine. Almost every scooter in the market has a single-cylinder engine. 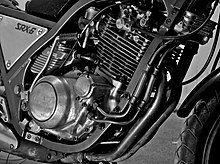 Many motorcycles with strong single-cylinder engines are available as well. There are sportbikes like the KTM 690 Duke R which has a 70 hp 690 cc single-cylinder engine, dual-sport motorcycles like the BMW G650GS, scooters like Gilera Fuoco 500 as well as classics like the Royal Enfield 500 Bullet with a long-stroke single-cylinder engine. ^ David Blasco. "Royal Enfield Motorcycles". Royalenfields.com. Archived from the original on 2011-12-07. Retrieved 2011-12-06.